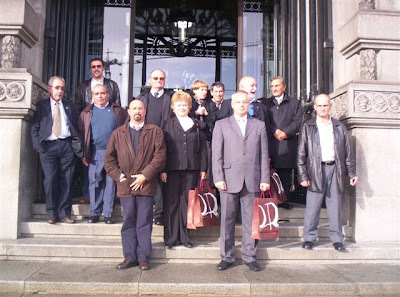 The FIMITIC Executive Board met in Porto, Portugal on October 28-30, 2004. The meeting followed a Joint Seminar meeting with the Board of its national Portuguese member association ANDST (National Association of Disabled by Work Accidents) which was held on 29 October. The main subjects on the Executive Board meeting agenda were: the detailed reports outlining the present and future activities in compliance of the decisions taken and with view to the ongoing preparatory work for the FIMITIC Delegates´ Conference which will take place from October 05 - 10, 2005 in Switzerland. At the Joint Seminar at the ANDST headquarters the consultations did focus on the current socio-political situation of Disabled People in Europe and on the central ANDST issue, the Occupational Health and Safety, Victims of Work and of Professional Diseases. The difficult situation of Disabled People in Portugal and the urgent need for reforms supported by political will urgently needed was shown by ANDST as the representative advocate of victims of work accidents in Portugal. The living and working conditions of physically disabled people in Portugal and in other European countries were reflected. Especially also whenever circumstances change, at a change of job, unemployment or retirement arising from an accident. At the meeting, presentations were given by present country experts from Austria, Germany, Croatia, Italy, Portugal and Switzerland, followed by questions. An overall view on the work of FIMITIC and its comparison done in the field of Prevention and Compensation of Industrial Accidents and Occupational Diseases in Europe was given. The urgent need for a presentation concept on national and international level in the field was agreed on. The experienced Croatian side accepted to coordinate the expertise between the FIMITIC member associations, supported by the office of HSUIR (Croatian Association of Societies of Disabled Workers) in Zagreb, Croatia. The meetings were chaired by the Presidents of ANDST, José Aráujo and FIMITIC, Marija-Lidija Stiglic. The exchange of views in personal talks with the Portuguese partners have shown the basis to strengthen the future co-operation. The good organisation and run of the Porto meetings in cooperation with the host association was very much appreciated. The highlight of the programme was the reception at the Town Hall by the Vice-Mayor. The efforts of the Porto community were pointed out by Joao Cottim Oliveira, the only Portuguese purveyor responsible for disabled people, at the welcome and dinner offered on the occasion on behalf of the Town of Porto.